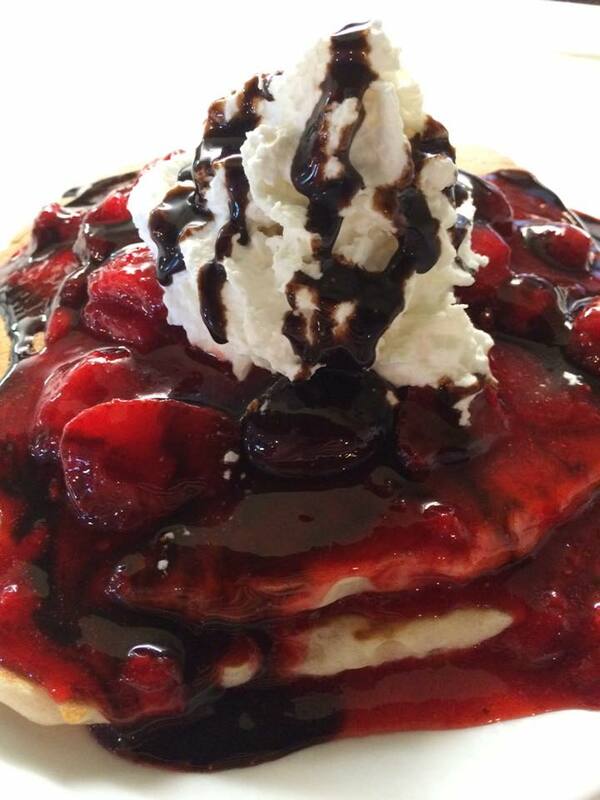 Located in Glendora, Peppertree Cafe creates All-American favorites that will have your mouth watering. Peppertree Cafe has been serving the local community for over 20 years and is located in the heart of the San Gabriel Valley. Our chefs have been serving both classic American dishes and pies that venture into the uncharted territories of deliciousness! Peppertree Cafe's interior, designed to give a casual, at home feel, reflects the sensibilities of the surrounding area while also paying tribute to Glendora's storied past. The indoor outdoor restaurant offers the choice to observe passers-by in the glass-encased patio, sit in our main dining room or watch the art of cooking as it occurs in the open-kitchen diner style area. We pride ourselves in being Glendora's favorite family restaurant and thank the community for voting us Favorite Family Restaurant 5 years in a row! We will continue serving new homestyle specials daily and for larger groups, our.banquet room can accommodate groups up to 60 people. Don't forget to check out our beer and wine menu to indulge in a refreshing libation. We look forward to the pleasure of serving you and invite you to taste the difference! Huge breakfast menu & a wide-ranging selection of American comfort food.- always with a cold beverage in hand. Served with extra large ranch eggs served and your choice of two breakfast sides. Spicy sausage links with XL ranch eggs. 1/2 lb charbroiled burger patty with XL eggs. 7 oz USDA top sirloin grilled to order. Sausage patties covered with biscuits and gravy, 3 XL eggs and 1 breakfast side. A beef steak breaded and fried like chicken, covered with country gravy with 3 XL eggs and 2 breakfast sides. Two poached eggs with Canadian bacon on an English muffin, topped with Hollandaise sauce. Served with one breakfast side (served till noon daily). Fresh spinach, avocado, tomato slices and poached eggs on a toasted English muffin. Smothered with Hollandaise sauce. Served with one breakfast side (served till noon daily). Smothered with country gravy. Served with 3 XL eggs and 2 breakfast sides. Over 1 lb. Bone-in ham steak with 3 XL eggs and 2 breakfast sides. Ham, 2 pieces of bacon and sausage with 3 XL eggs and 2 breakfast sides. All items below served with choice of one breakfast side. Grilled tavern ham, scrambled eggs and cheddar on grilled sourdough. Applewood bacon, 2 fried eggs, cheese, lettuce, tomato and mayo on thick sliced Texas toast. Fresh spinach, tomato, mushroom, onion, bell pepper and cheese blended with 3 scrambled egg whites on a grilled ciabatta roll. Bacon, green chilies, tomato, scrambled eggs and pepperjack cheese served on grilled sourdough. Chopped in house roasted beef, with scrambled eggs, green chilies, tomato, onion and cheese in a large flour tortilla. Served with salsa and one breakfast side. Bacon, sausage, bell pepper, onion, potatoes, scrambled eggs and cheddar cheese wrapped in a large flour tortilla. Served with salsa and one breakfast side. Beef chorizo, tomato, onion, scrambled eggs and cheese wrapped in a large, flour tortilla. Served with salsa and one breakfast side. 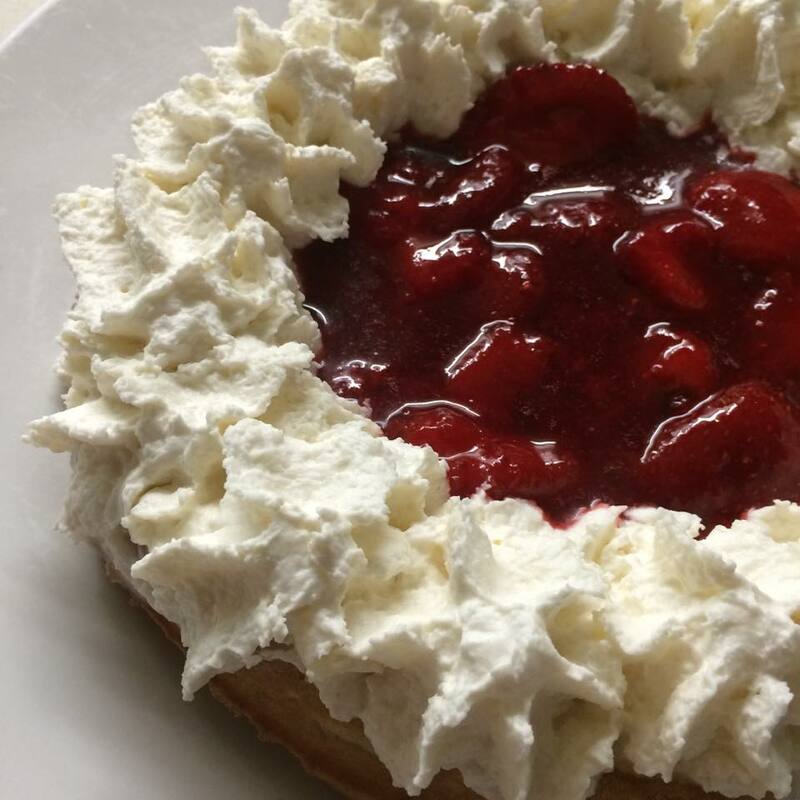 Served with whipped butter and rich maple or one of our flavored syrups: boysenberry, blueberry, pecan or coconut. Make any griddle item deluxe, add 2 extra large ranch eggs and 2 bacon or sausage, just $2.79. 3 made from scratch corn pancakes drizzled with honey. Chocolate chips and pecans baked inside then topped with fresh banana slices, real whipped cream and chocolate syrup. 2 large buttermilk pancakes stuffed with chocolate Nutella and topped with strawberries and real whipped cream. Tangy blueberries cooked in the batter. Served sprinkled with powdered sugar. 2 pancakes, 2 eggs, 2 bacon and 2 sausage. 3 sausage links rolled in buttermilk hotcakes, sprinkled with powdered sugar. Served with 2 eggs, 2 bacon or 2 sausage. All scramblers served with two breakfast sides and your choice of cheese. Add avocado for $1.59 extra. Ham, sausage, onion blended with scrambled eggs and topped with country gravy. Fresh spinach, mushrooms, tomato, bell pepper and onion blended with egg whites and topped with cheese. Spicy sausage with tomato and onion blended with scrambled eggs. Bacon, tomato and onion blended with scrambled eggs and topped with avocado. Ham, bacon and sausage blended with scrambled eggs. Tasty beef chorizo with tomato and onion, blended with scrambled eggs and topped with avocado. Bacon and tomato with green chilies blended with scrambled eggs, topped with avocado. Ham, bell pepper and onion blended with scrambled eggs. Diced ham blended with scrambled. Add avocado $1.59. All skillets are served with 3 extra large ranch eggs any style, your choice of cheese and one breakfast side item. General portion of bone-in ham steak over country potatoes, topped with eggs any style and your choice of cheese. Country potatoes layered with a burger patty, eggs any style and choice of cheese. Chicken fried steak over country potatoes, topped with eggs any style and choice of cheese, served with country gravy. Chicken breast served over country potatoes, topped with eggs any style and choice of cheese. Made with 4 fresh ranch eggs, served with your choice of 2 breakfast sides. Polish sausage, bell pepper and onion topped with choice of cheese. Generous portion of bacon, ham, sausage and cheese. Spicy green, chillies blended with fresh egg into an omelette. Tasty chorizo with chopped onion and tomato, topped with avocado and cheddar cheese. Fajita seasoned chicken breast, sauteed with bell pepper and onion. Topped with avocado and choice of cheese. Our traditional omelette blended with crisp bacon and topped with cheese and avocado. 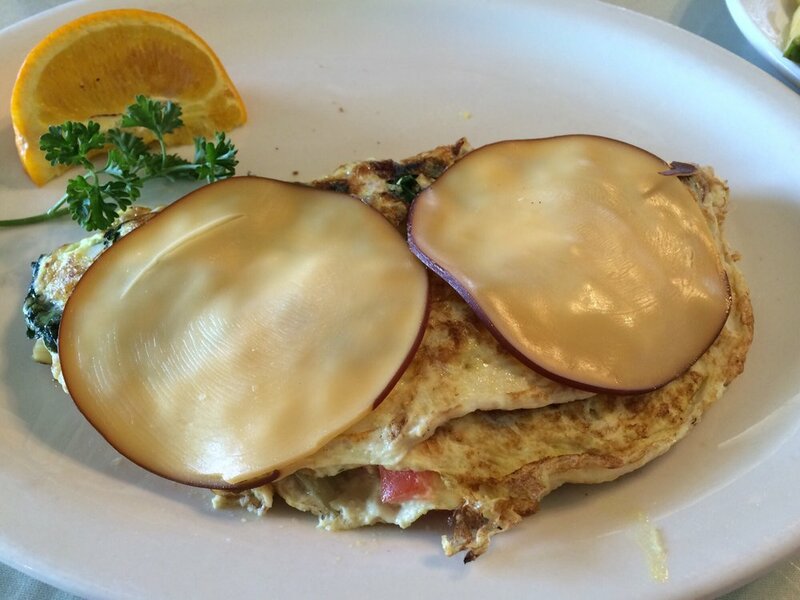 Fresh mushrooms, bell pepper, tomato, onion and cheese blended with fresh eggs. A bowl of our soup served with a tossed green salad and garlic cheese bread. Sliced grilled chicken breast, almonds, fried wonton and lettuce tossed in a special Asian dressing. A flour tortilla bowl filled with lettuce, tomato, black olives, cheddar cheese, sour cream and spicy fajita style chicken breast. 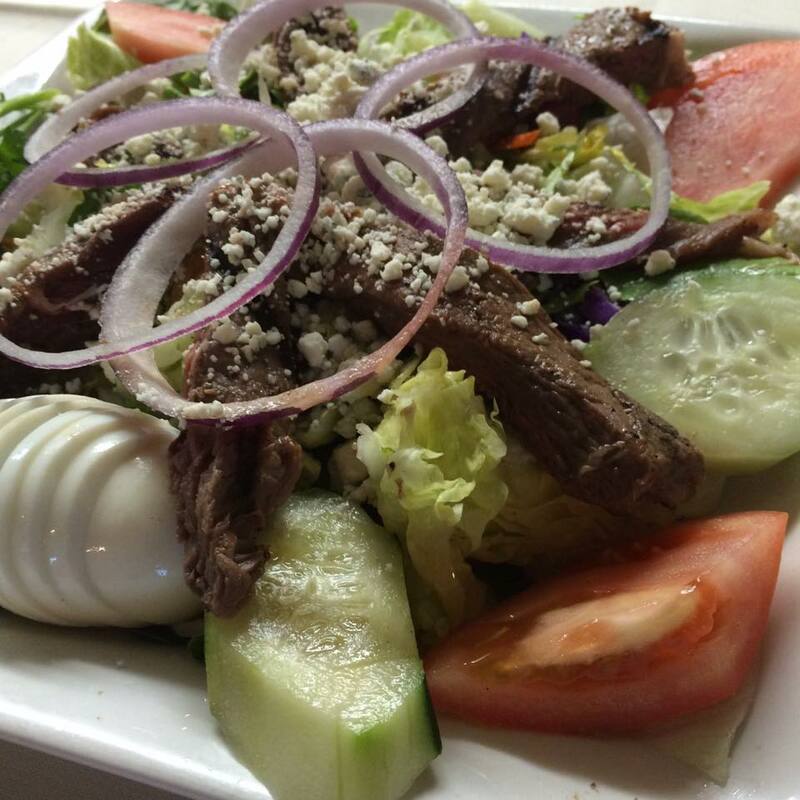 Sliced top sirloin steak with bleu cheese crumbles, tomato, cucumber, red onion and boiled egg on a bed of fresh greens. 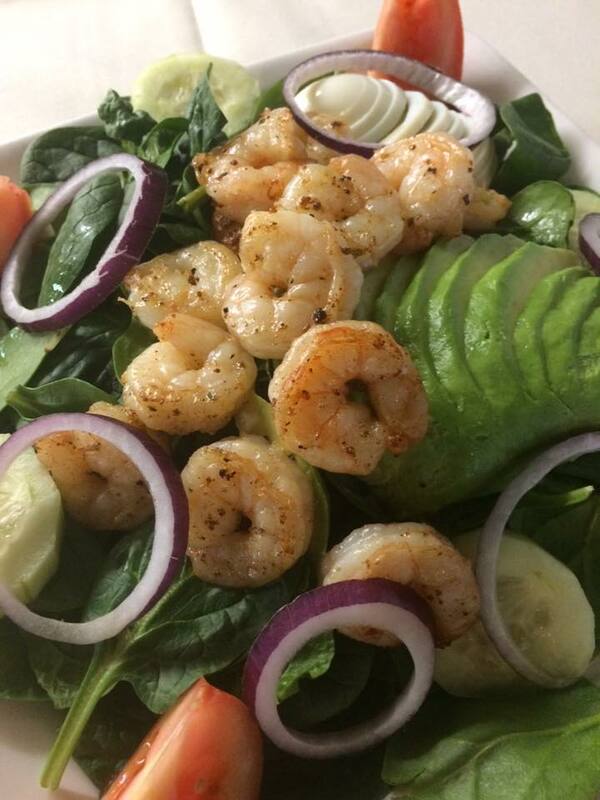 Sauteed shrimp with avocado, tomato, cucumber, boiled egg and red onion on a bed of fresh spinach. Julienne of ham, turkey, American and swiss cheeses served with garden fresh vegetables on a bed of crisp greens (shown). Creamy mozzarella cheese breaded and deep fried to a golden brown. Served with marinara sauce for dipping. Golden fries smothered with chili and cheddar cheese. (Onions on request). Deep fried wings with ranch dressing. Regular or buffalo style (spicy). Breaded chicken strips served with French fries and ranch dressing for dipping. This delightful combination includes mozzarella sticks, zucchini sticks, onion rings and breaded wings. Served with marinara sauce and ranch dressing for dipping. Choice of French fries, onion rings or fresh fruit. Make it a combo: 1.99 adds onion rings and zucchini sticks to any sandwich. Add green salad or soup $2.49. In house roasted beef with sauteed mushrooms and onion, pepper jack cheese and horseradish mayo on a grilled ciabatta roll. Applewood smoked bacon, turkey breast, avocado, tomato and jack cheese on grilled sourdough bread. Deep fried breaded pork chops with lettuce, tomato and mayo on a grilled ciabatta roll. Grilled pastrami with sauerkraut, Swiss cheese and thousand island on grilled marble rye. House roasted turkey breast, ham, Swiss cheese, tomato and pesto sauce on grilled sourdough bread. Boneless chicken breast with Swiss cheese, lettuce, tomato and pesto sauce on a grilled ciabatta roll. Sliced top sirloin steak with lettuce, tomato and mayo on a grilled ciabatta roll. A bowl of our hearty soup served with a garden salad and half of a sandwich. Your choice of turkey, roast beef, ham, tuna or B. L. T. Prepared on your choice of bread. Choice of hot roast beef or turkey with cranberry sauce freshly roasted and nicely sliced, served open faced on white bread covered with brown gravy and a generous helping of fluffy mashed potatoes. Fajita-marinated chicken breast topped with green chilies and jack cheese on a bun. Marinated chicken breast topped with bacon and jack cheese on a bun. Roast beef on a toasted ciabatta roll, with Au jus. A pound of pastrami on grilled rye with jack cheese. Turkey, bacon, ham, cheddar cheese and tomato on grilled parmesan sourdough. 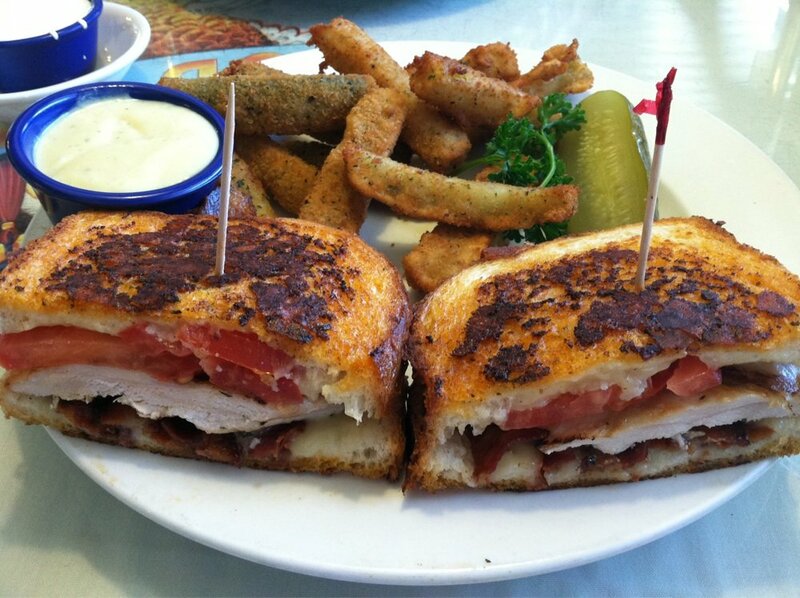 Fresh roasted turkey breast, bacon, lettuce and tomato, piled high on your choice of bread. Tender roast beef, green chilies, tomato and jack cheese on grilled parmesan sourdough. Burgers are 1/2 pound of USDA ground beef, choice of French fries, onion rings, or fresh fruit. Add cheese for $0.89 extra. Combo with onion rings and zucchini sticks add $1.99. Add green salad or soup $2.49. Our classic 1/2 lb burger. 1/2 lb burger served with French fries, onion rings and deep fried zucchini. Topped with bacon, green chiles, pepper jack cheese and avocado. 1/2 lb burger topped with sauteed mushrooms, Swiss cheese and horseradish mayo on a grilled ciabatta roll. 1/2 lb burger topped with applewood smoked bacon, avocado and cheese on a bun. 1/2 lb burger topped with applewood smoked bacon, cheddar cheese, and a fried egg on a grilled bun. Burgers are 1/2 pound of usda ground beef, choice of French fries, onion rings, or fresh fruit. Add cheese for $0.89 exra. Combo with onion rings and zucchini sticks add $1.99. Our 1/$2 lb burger with American cheese, bacon and tomatoes on grilled parmesan sourdough bread. Tasty fillings rolled in a thin tortilla with choice of fries, onion rings or fresh fruit. Chicken breast, lettuce and tomato with Caesar dressing. Chicken breast, wontons, almonds and lettuce with sesame dressing. Sliced turkey, bacon, lettuce and tomato. Chipotle chicken breast, avocado, bacon, lettuce, tomato and ranch dressing. Chicken breast with lettuce and tomato and jack cheese. Breaded chicken in buffalo sauce with cheddar, lettuce and tomato. Turkey breast, bacon, lettuce, tomato and bleu cheese, served with ranch for dipping. With soup of the day or garden salad and your choice of one of the following: rice pilaf, one pound baked potato (served only after 12), steamed vegetables, sauteed garlic vegetables, mashed potatoes and gravy. In house roasted beef served over Fettuccini noodles and smothered with rich brown gravy. 2 breaded pork chops fried to a golden brown and smothered with country gravy. Boneless chicken breast smothered with mushrooms, bell pepper, onion and jack cheese. Fried chicken tenderloins over buttermilk biscuits and smothered with country gravy. A marinated chicken breast topped with grilled ham and swiss cheese. Citrus chicken sliced and sauteed with fresh vegetables placed on a bed of a bed of rice pilaf (no choice of potato). Medium steaks cooked to light pink at center. Served with soup of the day or a garden salad and choice of one: rice pilaf, baked potato (served after 12 pm), steamed vegetables, sauteed garlic vegetables or mashed potatoes and gravy. Juicy top sirloin charbroiled to perfection. Chopped top sirloin steak served on mashed potatoes covered in mushroom gravy ( no choice of potato). Juicy 10 oz. New York steak cooked to order. Get three of our best: top sirloin steak, chicken breast and jumbo shrimp. Top sirloin steak sliced and sauteed with fresh vegetables, placed on a bed of rice pilaf (no choice of potato). Juicy sirloin steak with garlic butter sauteed shrimp. Juicy sirloin steak with 4 jumbo fried shrimp. Flavorful rib eye steak charbroiled to your liking. 2 grilled large flour tortillas filled with choice of cheese, served with fries or fresh fruit. 1/2 burger with applewood smoked bacon, lettuce and tomato, inside a cheese quesadilla. Tender fettuccine tossed with a creamy Alfredo sauce and parmesan cheese. Sauteed shrimp in a garlic butter sauce served over angel hair pasta. Boneless chicken breast with fresh spinach in a Alfredo pesto sauce served over Fettuccini noodles. Delicate angel hair pasta served with marinara sauce. Served with soup of the day or garden salad and choice of side. Lightly coated with lemon pepper breading and sauteed in butter. Cooked with spicy cajun spices. English style battered fish fillets fried to a golden brown. Lightly breaded jumbo shrimp deep fried golden brown, served with tangy cocktail sauce. Served with cottage cheese, tomatoes and fresh fruit. Juicy top sirloin steak charbroiled to perfection. Charbroiled to order or substitute garden burger. Nicely grilled and served with cottage cheese, sliced tomatoes and fresh fruit. Boneless, skinless chicken breast marinated in fresh herbs and spices and delicately charbroiled. Pepsi, diet pepsi, dr. Pepper, orange crush, mountain dew, sierra mist, root beer. Use our 60 person banquet room for your next gathering! Check out our menu to get started. A silky smooth cheese filling surrounded by a buttery walnut graham cracker crust. Hot apple cobbler topped with vanilla ice cream, whipped cream and caramel sauce. This dark dense dessert explodes with chocolate. Everyone's favorite, with cream cheese icing. Chocolate, strawberry or hot fudge. Sliced banana, two scoops of ice cream and hot fudge, makes this a winner. "There has never been a sadness that can't be cured by breakfast food!"